It's time for another DeNami Design Product Spotlight! 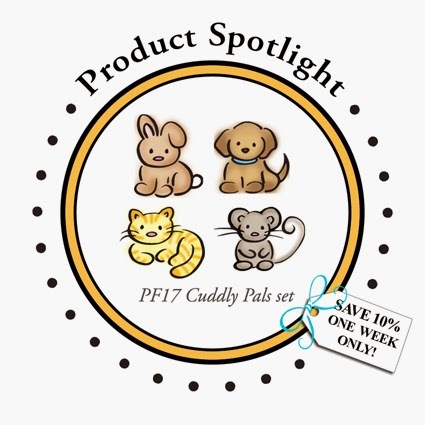 Today the DeNami design team is featuring a super cute stamp set called Cuddly Pals. Be sure to check out the rest of the team's lovely creations today on the DeNami blog. Like what you see? Then you can score a great deal on the Cuddly Pals set--as our Spotlight Product, it's on sale at 10% off for the next week!! Seriously CUTE card Emly!! I love the way you've used the retro border, what a great idea!! Emily, this is so fun for St. Patrick's Day! Seriously who wouldn't love this cutie greeting them Top of the Mornin'? Totally made me smile! Cute, cute card, Emily. I really love that retro borders set..very cool. So adorable, and how fun to color them all in green!! Perfect for St. Patrick's Day! Now that's definitely a cute way to celebrate St Patty's Day! So many cute little green critters. I really like the way you placed them in the circles with the scalloped dots edging. Oh my gosh, what a cute set. I love that little mouse. They are all sweet though. Oh my goodness, Emily! Who would have ever thought to make all these cuties green for a St Patrick's Day card? !--obviously, the super creative Emily! Darling...absolutely darling! Your little green-shaded critters are such cutie-patooties sporting their festive green! Sweetness, plus! Embossed Elements: BASKET WEAVE + a Giveaway! Birthdays are like purses . . .